Zanzibar items are rare – and yet Zanzibar was an important centre for trade especially in ivory, slaves, spices, grain and many other items. It linked the east coast of Africa to the middle east and to India. As a consequence, it was an important centre for raw materials for the production of luxury goods that were subsequently traded around the world, including to Europe and the United States. 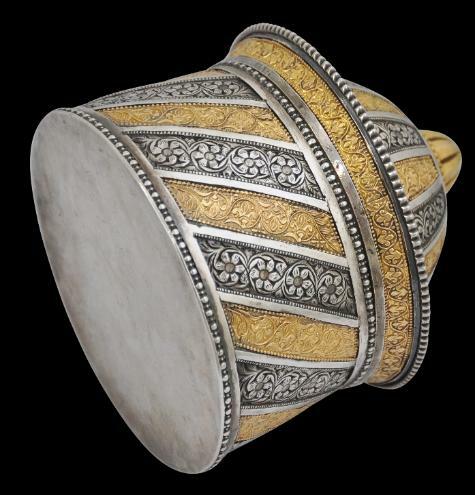 It was ruled by an Islamic sultan installed in a local palace and as a consequence there was demand for local production of luxury goods as well, for the palace and related aristocrats and wealthy merchants and also to be given as diplomatic gifts. It is in this context that the gold and silver box here can be considered. 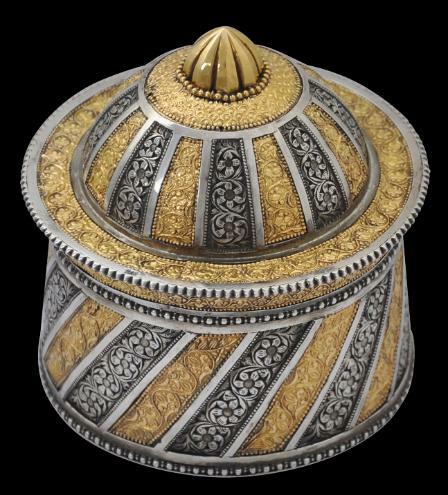 The box, most probably intended to serve as or based on a betel nut (tambuu) box, comprises a base and a tightly fitting domed lid. 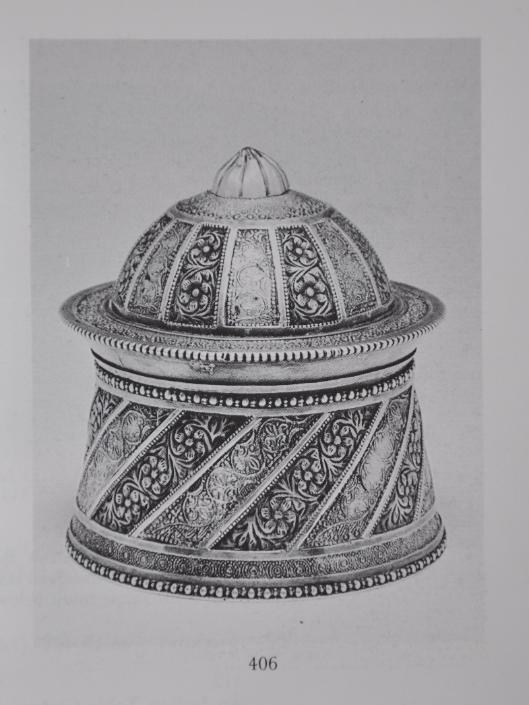 Both the base and the lid are of beaten silver that has been chased with a total of 17 separate panels of trellised flowers which radiate around the base and lid. They are separated by 20 inset panels of gold sheet, chased with trellised leaf motifs. 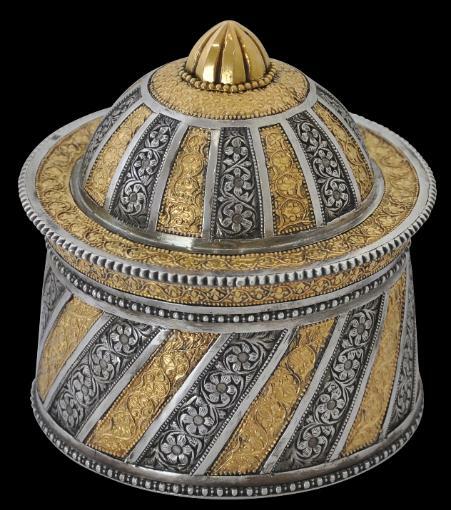 The lid is surmounted by a domed gold finial, and has an over-hanging rim. The silver edges of the base and lid have been ‘beaded’ or ‘pearled’. Overall, the box and cover have an Islamic architectural form. We know of only one other similar box. 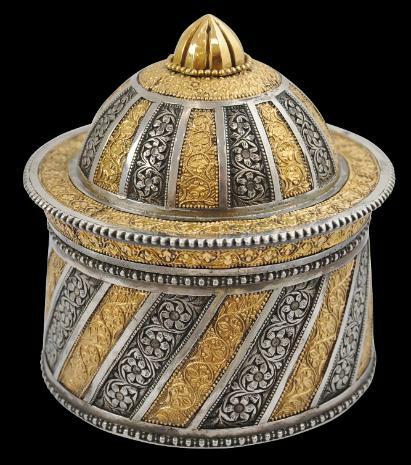 That box comprised lot 406 of Sotheby’s London ‘Indian, Himalayan and South-East Asian Art’, November 23, 1987 (see below for an image). 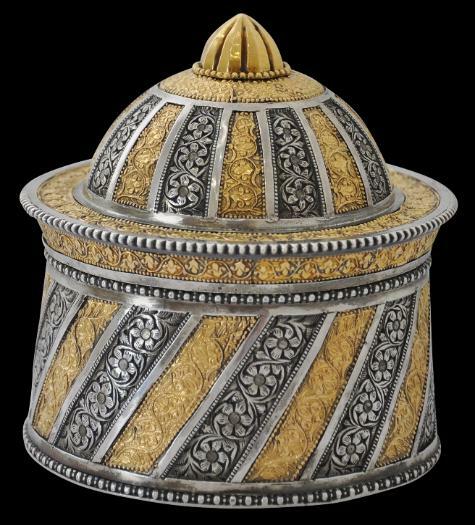 The box at that time was catalogued (incorrectly) as Sinhalese and was attributed to the 18th-19th century. 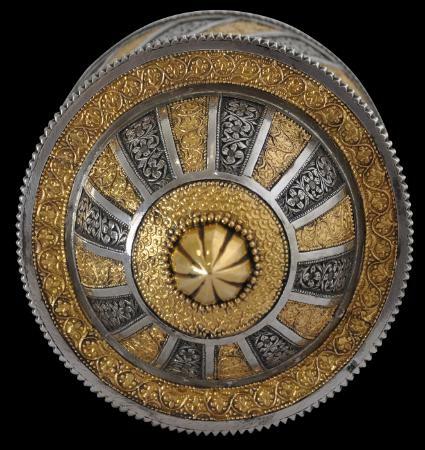 The Sotheby’s box was almost identical to the box here, although with a diameter of 9.5cm was significantly smaller. 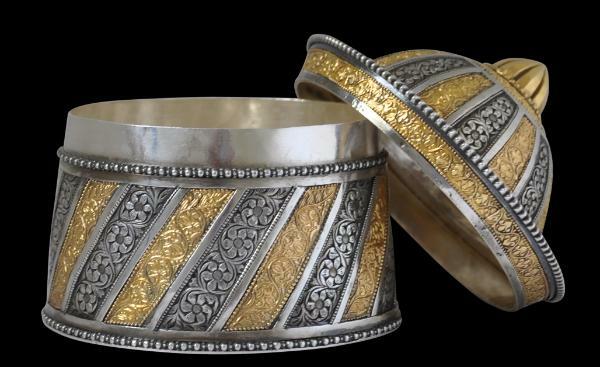 Importantly, that box had a gold band running around the lower part of the base (but not one running around the underside of the rim as our does) and that band was decorated with repeated circular sun-burst motifs. Inset gold plaques decorated with this motifs seems to be characteristic of Zanzibar work. Such panels can be seen on the ivory hilts of Omani-influenced sword that were manufactured in Zanzibar in the eighteenth century. Examples of these swords are illustrated in Hales (2013, pp. 237-139). The same panels also appear on an ivory hair comb that we had and which was attributable to Zanzibar and which is now in the collection of the Minneapolis Institute of Art (see here for the comb.) The Sotheby’s example with its gold plaques allows us to attribute the example here to Zanzibar. The box here is in perfect condition. The box came from the estate of Mary Crew-Milnes, the Duchess of Roxburgh and was kept at her country house, West Horsley Place, until her death in 2014. Her godmother was Queen Mary and her mother was a daughter of the Earl of Rosebery, a former British prime minister. Mary married the Duke of Roxburgh in 1935, although they later divorced. Islamic and Oriental Arms and Armour: A Lifetime’s Passion, Robert Hale CI Ltd, 2013.Provenance: estate of Mary Crew-Milnes, the Duchess of Roxburgh.